224 pages | 22 B/W Illus. National competitiveness has become a misnomer, as competitiveness is increasingly understood as a regional phenomenon and regions are not confined to the boundaries of the nation state. This book focusses on the port of Rotterdam and its hinterland – i.e. the Lower Rhine and the Ruhr area. A transnational perspective is imperative to understand the historical trajectories of the port, the hinterland and the region itself. 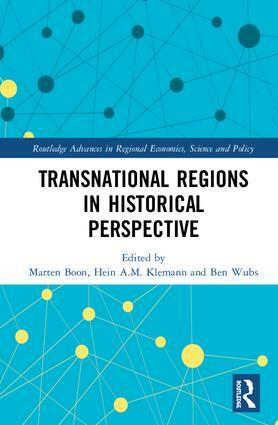 This book brings geography and the transnational study of regions back into the historical discipline, linking places to larger geographical scales and to systems of production and consumption and the global chains in which they are organised. This book will be of interest to scholars and practitioners in urban studies, urban planning, public policy, geography and political science. Marten Boon is a researcher at the University of Oslo and an affiliated researcher at the Norwegian University of Science and Technology in Trondheim. Hein A.M. Klemann is Professor of Social and Economic History at Erasmus School of History, Culture and Communication, Erasmus University Rotterdam. Ben Wubs is Professor of International Business History at Erasmus School of History, Culture and Communication, Erasmus University Rotterdam, and Appointed Project Professor at the Graduate School of Economics, Kyoto University.